Payment for your course is to be made in full at least two weeks prior to the commencement of your course by cheque or bank transfer. There are only 8 places in each atelier. 1. Register your interest online (see below). 2. Check dates, times and fees. 3. Read the terms and conditions (below). 4. When we receive your application we will send you confirmation of your place. 5. Pay by bank transfer or by cheque (details below). 6. Please keep a copy of the transfer document/receipts. If for some unforeseen reason, you are unable to attend a class, we will provide you with a learning kit to help you get ready for the next atelier. ​We reserve the right to cancel classes which do not meet the required minimum number of participants enrolled by the cut-off date. A full refund will be given to enrollees in this instance. 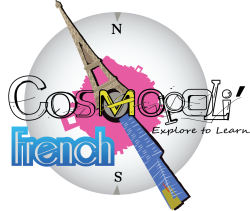 If you would like any more information please do not hesitate to contact us by email on info@cosmopolifrench.com or Nathalie by phone on 0424 284 586.